INDIANAPOLIS -- Frank Staples has worked at Carrier for 11 years. He was planning on retiring from the company until they announced they were relocating his job. “I come out of high school, very little college education and was looking forward to retire from there and then maybe someday, maybe my kids working there – it’s not going to happen now," he said. He was one of many Carrier employees who made their presence -- and their frustrations -- known at the Statehouse this week. 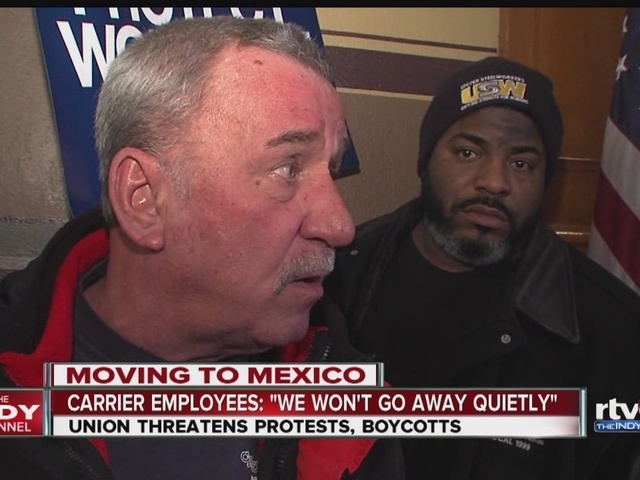 About 400 members of the United Steelworkers Union District 7 traveled to Indianapolis from all over the state Tuesday morning to march to the Statehouse to voice their opposition to the Carrier move to Monterrey, Mexico. On Wednesday, several Carrier employees stood outside as Gov. Pence met with United Technologies Corp. Climate, Controls and Security President Robert McDonough. A few employees, including Staples, were invited in to talk to the governor after the meeting. “I told him that we’re not going away quietly. We didn’t pick this fight, we had a good quality workforce, that plant has been there since the 1950s, not no point in time were they not profitable, it’s just corporate creed. So if they think we’re walking away quietly, they’re wrong," Chuck Jones, the president of United Steelworkers Local 1999 said.